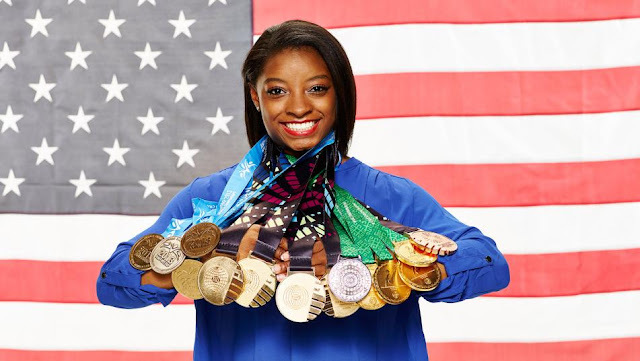 Biles was born in Ohio her mother was battling drug and alcohol abuse and therefore at three she was taken away from her mother. Her grandparents in Texas adopted Biles and her younger sister. Biles calls her grandparents “mom and dad.” At the age of 6, Biles started gymnastics. Her mother told the Washington Post, “she always had loved bouncing on furniture in the house, so much so that her mother, Nellie, had grown weary of harping that the sofa and chairs weren’t a playground.” She trains at least 32 hours a week and is only 4'8. She is homeschooled to give her more time for training. SHARE this maybe you'll Inspire another young Athlete!